Live in less space but have more room to enjoy it. Does that sound like a contradiction? On the contrary, living small frees up your mind, your wallet, and your soul. Discover how to build, remodel, redecorate, or profoundly rethink your needs. Pockets of people all over the continent are realizing the benefits of scaling down. 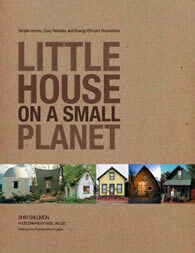 In LITTLE HOUSE ON A SMALL PLANET they show how to think -sometimes literally- outside the box, how to live close and simple, and how to apply spiritual and social solutions to your material desires. You, too, can build a joyful, sane life that emphasizes home life over home maintenance. Improve your life by scaling back, painlessly, joyfully, and deliciously.